Thank you to all who attended Seahawk Preview Day 2019! Seahawk Preview Day is the University of North Carolina Wilmington's spring open house event for admitted students. We hope you are able to discover the academic and experiential opportunities that await you as a member of the Seahawk community. We believe visiting the campus is the best way for students to get a true feel of the university and its programs, we hope you enjoy your visit! To view the Seahawk Preview Day schedule and session offerings, please see below. Check-in will take place in Trask Coliseum beginning at 8:00 am. We will host a formal welcome session from 9:00 - 9:30 AM, but registration will remain open until 11:30 for those who do not wish to attend the morning welcome. At Check-in you will receive your registration packet including your detailed schedule, campus maps, and other materials. A variety of sessions will be available to allow you to learn more about different aspects of academic and campus life at UNCW. Below is the schedule for Seahawk Preview Day 2019. Seahawk Preview Day is designed to allow students and their guests to select sessions that are most important to them throughout the day. You are encouraged to divide and conquer sessions as necessary. Visitors should plan to check-in at Trask Coliseum (if arriving before 11:30 AM) or James Hall (if after 11:30 AM) for a comprehensive visit packet, including locations for all of the below mentioned sessions. The UNCW Alumni Association invites incoming legacy students (students with a parent, grandparent or sibling who have attended UNCW) and their families, to join us for a breakfast to celebrate our most devoted Seahawks. Register here! Have you made your decision to attend UNCW? We’re here to help! Work with UNCW staff members to pay your $100 enrollment deposit (by credit or debit card only), register for your required orientation session, and turn in your immunization and medical history form. You will also have the option to sign your housing agreement and pay your $105 fee for on-campus housing (required for first-year students, optional for transfer students). You can also receive preliminary information that every Seahawk needs to know about submitting your photo online for your one card, meal plans, ordering books, parking, bike share and much more! Campus tours will last approximately one hour and groups will depart regularly between 9:30 AM and 1:00 PM. NOTE: Residence Hall tours are available separately (see below). Meet Housing & Residence Life staff, tour designated first-year residence halls, and learn about living on-campus. You are encouraged to drive your vehicle to these areas since the campus tour will not visit residence halls. Visit with representatives from academic departments and student service offices on-campus to learn more about UNCW majors, programs, and resources. Light refreshments will be provided for guests in the Burney Center lobby. Join the College of Health & Human Services (CHHS) to learn more about our majors, college-wide initiatives, and student opportunities. Current CHHS students will be available for a short Q & A period at the end of the session. The College of Health & Human Services will be showcasing featured programs offered in conjunction with the College. Please stop by to learn more and get involved! NOTE: There will be Nursing Simulation Lab Tours, where sign up is required. You can sign up lobby from 10:30-11:45am for tours starting at 11:30am and 12:00pm. Guests will need to sign up ahead of time due to limited space, and tour reservations are on a first-come, first-served basis. An extension of the Academic Departments Fair, this fair will have representatives available to answer questions about each of the individual majors within CHHS including Nursing, Clinical Research, Social Work, Public Health Studies, Exercise Science, Physical Education and Health Teacher Licensure, Recreation, Sport and Tourism Management, and Recreation Therapy. Discover the variety of majors available within UNCW’s Watson College of Education. You will have the opportunity to speak with faculty, staff and Watson Student Leaders to hear specifics about each specific major within Watson College of Education. Explore the various majors and opportunities available within the College of Arts and Sciences. Faculty and staff from each major will be demonstrating what makes their department great with hands-on presentations and activities for guests. NOTE: Visitors can visit the College of Arts and Sciences representative in the Academic Departments fair for general information and a map of department locations. Learn about the financial aid process and timeline, and get answers to frequently asked financial aid questions. We strongly recommend all visitors who are interested in 1:1 Financial Aid counseling attend this session first. Students will have an opportunity to meet face to face with a financial aid counselor to discuss individual concerns regarding their financial aid that were not addressed in the Financial Aid FAQs session. Award information is communicated via UNCW email addresses and the student’s on-line SeaNet account. Please bring your UNCW ID number (found on your decision letter) with you. Join us to learn about the first-year experience at UNCW. This session will be focused on what first-year admitted students for Fall 2019 can expect as they prepare to transition from high school to life on-campus. Housing and Residence Life, Transition Programs, and University College will provide information about how to navigate the first year. Come ready to learn about what life on-campus is like, what transitional resources are available and the appropriate steps you should take to ensure a successful transition. Note: This session is for Fall admits. There is a separate FYSA Students, What’s Next Session. Learn more about what to expect next as you Transfer to Teal, including when academic advising occurs, when and how your transfer of credit is applied, and how to prepare for orientation. Hear from current UNCW students about things like the transition from high school to college, what it is like to live on campus, getting involved in student organizations, and more. NOTE: This session is for all accepted first-year students. Find out everything you need to know about off campus housing for transfer students. Learn about the one mile radius, and what living within that means for students. Participants will learn about the Off-Campus Housing website and leave with a packet of apartment complex brochures. Note: This session is recommended for transfer and first-year spring admit students only. Discover how you can give flight to your imagination as a Seahawk! UNCW provides a variety of resources for students to engage in exciting opportunities outside of the classroom and gain practical experience before graduating. In this session, learn about the opportunities and resources available to students through the Office of International Programs (Education Abroad), The Career Center and ETEAL (Applied Learning). Attend a mock class with faculty from the Watson College of Education taught by Dr. Susan Catapano, Class Title: Children’s Literature. Remember your favorite childhood book? Share that book, and hundreds more with students in your teaching career. Discover how children’s literature is a foundational tool to support children learning to read, write, and communicate orally. Come hear what learning communities are and the possible benefits of being in one during your first semester at UNCW. Find out about the different learning community options UNCW has to offer and learn how to apply. Ask questions of current students who were in communities their first-year. 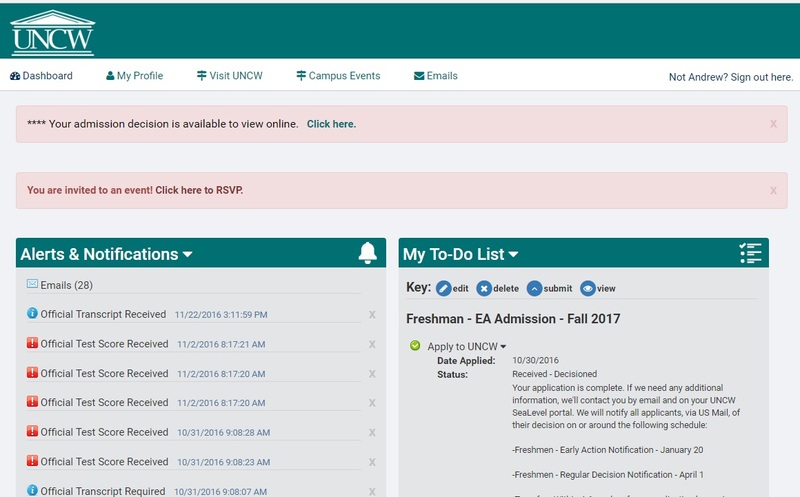 specific advising information to help in a successful transition from Early College programs to UNCW. Meet with academic advisors and UNCW students. First Year Spring Admit Students will have the opportunity to hear from the various staff members who will work with you throughout your transition to UNCW. The information session will help you learn more about the resources UNCW has to offer, and the various fall opportunities available to FYSA students. Come hear what UNCW’s Honors College is all about. Meet with representatives from the Honors College as well as current Honors College students. Learn about the application process, Honors curriculum, research opportunity and service activities available to students within the program. A new town brings new opportunities. Join us for a presentation by members of Wilmington’s Chamber of Commerce. Presenters will cover topics such as available resources in Wilmington, job and internship opportunities, sights and attractions in the area, among others. Birds of a feather flock together. UNCW is a home that brings future Seahawks with different backgrounds, cultures, identities and ethnicities together as one. Joins us for an opportunity to learn, adapt and flock together. Following the social, guests will have an opportunity to visit our Centro Hispano, LGBTQIA Resource Office, and Upperman African American Culture Center. Network with both newly admitted and current transfer students and meet various staff members who will work with you throughout your transition to UNCW. The Transfer to Teal social is an opportunity to get a jump start on your transition and learn more about the resources UNCW has to offer transfer students. All active duty and veteran service members. As well as dependents and their guests, are invited to join us for a social! Learn about resources for military affiliated students, the residency and financial aid processes, and network with other military affiliated students. Need to beat the heat? Or just want to rest your feet? Hop on our Seahawk Shuttle and take a loop around UNCW’s beautiful campus. You will have the chance to get off at our residence halls, or take some time to sit back and relax while a representative provides you with detailed information regarding campus. The shuttle will take continuous loops around campus from 10:00 -2:00 PM. NOTE: The shuttle can seat 31 guests. Suggested Hotels - click here for a list of suggested hotels. Dress Comfortably -- rooms may be warmer or cooler than the temperature outside, be prepared for a rain shower, and wear comfortable shoes (you will be walking throughout the campus). Eat Breakfast -- light refreshments and beverages will be available during the day, however, lunch will not be provided due to the strict schedule of events we must adhere to. Several dining locations on-campus will be open. Carpool -- we are expecting a large crowd, you are encouraged to carpool, if possible. Come Prepared -- pay close attention to the confirmation e-mail you receive! Bring your id number, e-mail address and other information with you. Plan to bring spending money, a credit or debit card to pay for enrollment, housing, and orientation fees and deposits. If you have additional questions about Seahawk Preview Day, please call the Office of Admissions at (910) 962-3243 or email us at admissions@uncw.edu (Subject: Seahawk Preview Day). Only admitted high school seniors and admitted transfer students will receive an invitation; this invite is sent directly to your SeaLevel account. Registration is required and must be completed using your SeaLevel account. We cannot take reservations over the phone. Log into your SeaLevel account using the account information you used when checking the status of your application. Note the invitation that appears towards the top of the page within your personal web portal. Click on "Click here to view invitations or change RSVP status." (Click here for an example). 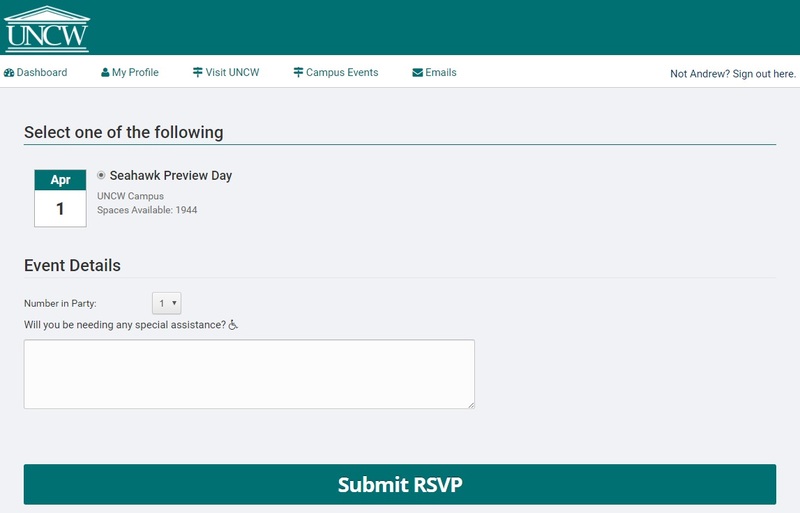 Under the event heading "Seahawk Preview Day", click on "RSVP". Select the program's date and location (Click here for an example). Complete the brief registration form and click "Accept Invitation". If you need to make any changes to your registration status or cancel your registration, please log into your SeaLevel account and follow the same process you used to register.